Tá suim agam le fada i kayakdóireacht. Tá mé im chónaí in áit ina bhfuil go leor cuanta, cósta agus oileáin i gConamara in Iarthar na hEireann. Tá cáil ar Chonamara le haghaidh seoltoireachta , iomra www.huiceiri.ie, www.seanomainnin.com. agus kayakadóireacht. Tá eagraíocht náisiúnta againn, an Irish Seakayaking Association ISKA , www.iska.ie , comhluadar daoine as chuile chéard don tír. Bíonn muid ag kayakadóireacht ar fud chósta na hÉireann agus thar lear freisin, ina measc, na Hebrides, oileain Lofoten, Cape Farewell i ndeisceart na Graonlainne. I am interested in kayaking for a long time. I live in Connemara, where there are wonderful coastlines, peninsulas, bays and islands to roam around. Connemara is renowned for traditional boat sailing, rowing and for kayaking, www.huiceiri.ie, www.seanomainnin.com. For kayakers, there is national organisation the Irish Seakayaking Association ISKA , www.iska.ie , a community of kayakers from all parts of Ireland. We kayak along the coastlines and to islands of Ireland and also kayak abroad, in areas like the Hebrides, Lofoten islands, and Cape Farewell in Southern Greenland. Is siúnéara mé agus d’fhoghlam mé mo chéird óm athair. Bhí an chéird sin ag na glúnta a chuaigh romham. Chuir mé suim i ndéantús báid déanta as snáithín gloine, (GRP) sna hochtaidí agus rinne me kayaks fibreglass a úsáideann mé fhéin agus mo chlann le blianta fada anois. I am a carpenter and I learnt my trade from my father. This trade has been in our family for generations. I became interested in building kayaks form fibreglass in the eighties and I built many fibreglass boats that our family have paddled in over the years. Ag fear as Guaire, Co Loch Garman, Willie Stedman a chonaic mé kayak déanta as strips cedar an chéad uair agus thaitnigh sí go mór liom. Rinne mé ceann beirte 21’ ar fhad agus úsaideann mé fhéin agus mo bhean Máire í. Ina dhiaidh sin rinne mé ceann singil. Agus anois tá na cheithre cinn seo atá ag dul go dtí an Ghraonlainn, beagnach críochnaithe anois. 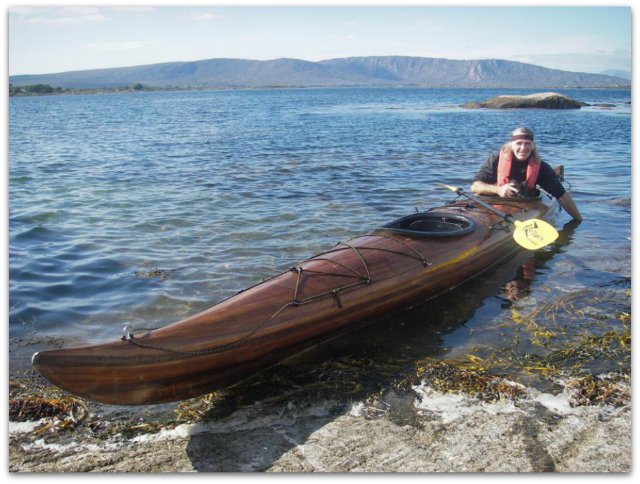 The first cedar strip Kayak that I saw was built by Willie Stedman from Gorey, in Co Wexford. I liked it very much. I made a 21’double that I paddle with my wife, Maire. After that I made a single. And now I have made these four kayaks, almost ready to go to Greenland. I have built four seakayaks for this trip to the Arctic and Greenland - North of Disko II. It was Jamie’s idea to build cedarstrip kayaks for the trip and he asked would I be interested. The trip to Greenland in a sailing boat and the chance to kayak in Greenland was something I had been dreaming about. That was last November 2014. Six month later I am just nearly finished building them, barely in time for the expedition. There are many steps to building a cedar strip kayak so it is no wonder that it took the six months to build. I am looking forward to paddling them with my team, Dave, Trish, Conor, during our time in Greenland. 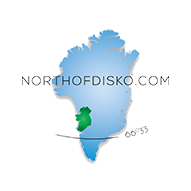 The plan is to paddle North of Upernavik to the northernmost settlements in the Upernavik area in West Greenland . It is a spectacular and unique area with fjords, glaciers, islands and icebergs. It is an area experiencing the retreat of the icecap, I will be interested to see and to hear how this is impacting on the Inuit communities.